In West Berlin to reassure her citizens that the United States would never desert them in the face of Russian threats, Vice-President Lyndon Johnson is cheered long and loud by hundreds of thousands of Germans. As President Kennedy's envoy, Mr. Johnson declares that freedom can prevail and peace endure. 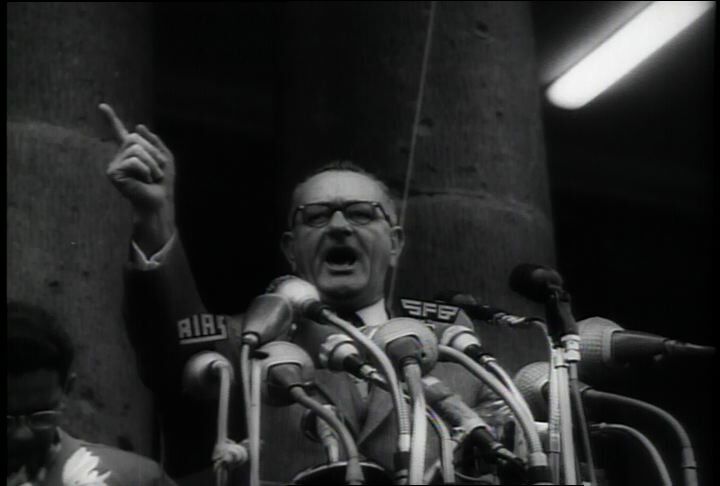 He has a statement for East Berliners as he addressed 300,000 at City Hall: "the days of tyranny are numbered." Later, 1,500 American troops arrive in the beleaguered city after passing through East Germany without incident. They received a huge welcome from the grateful city. Chicago: “War and Peace in the Nuclear Age; At the Brink; Germans Hail Johnson Visit,” 08/21/1961, WGBH Media Library & Archives, accessed April 23, 2019, http://openvault.wgbh.org/catalog/V_D9DEE1C94F65494EA2DA30117AE6EB59. MLA: “War and Peace in the Nuclear Age; At the Brink; Germans Hail Johnson Visit.” 08/21/1961. WGBH Media Library & Archives. Web. April 23, 2019. <http://openvault.wgbh.org/catalog/V_D9DEE1C94F65494EA2DA30117AE6EB59>.